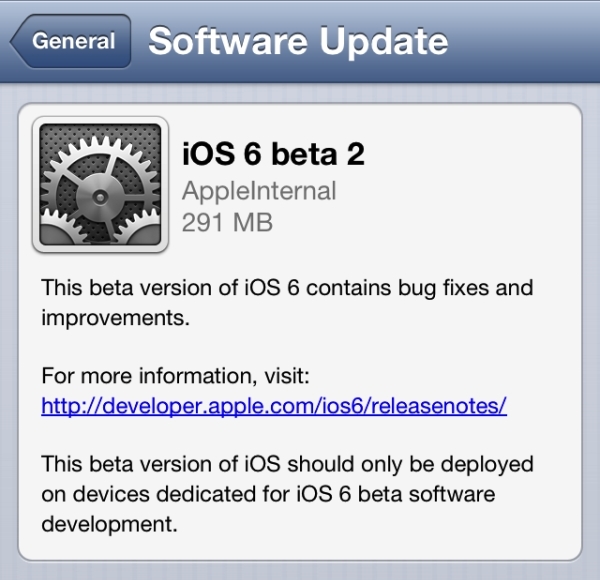 Apple released the first version of the iOS 6 beta for developers during the WWDC keynote on June 11. Now, two weeks later, the second beta is being seeded to those installed the first on their iOS devices. The update brings several bug fixes and performance updates, including fixes for the Address Book, Game Center, iCloud, iMessage and FaceTime, Maps and Safari. You can find the entire exhaustive list in the source link below. One minor feature that has been noted is that when you are downloading this update, the Settings icon you see on the side is animated, so you can see the gears moving within. We wish Apple extended this functionality to app icons as well so they can animate and show some more information rather than just a just static image.